Size of Female: 70-90 lbs., 26-28 in. The Kuvasz developed into the dog we know today in Hungary after the 9th century. Bold and courageous, these livestock guardian dogs are devoted to their families and very protective. When it comes to demonstrating affection, Kuvaszok (the plural version) are not the most cuddly dogs, but they will always take care of you and your family. This dog breed can be good with children if they are raised with them from a young age. These dogs are not a good fit for every family. 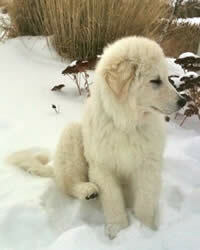 The Kuvasz is a very old breed and their exact origins are unknown. Some speculate that they come from Tibet and others claim the dogs are from Mesopotamia. The name Kuvasz is Turkish (kawasz) meaning “armed guard of the nobility” or Arabian (kawwasz) meaning “archer,” suggesting the breed’s protective nature. Whatever the case, dogs of this type were taken with the Magyar tribes when they moved into the Carpathian Basin in Hungary sometime around 2000 BC. They conquered this area in 896 AD. The fossilized skeleton of a 9th century Kuvasz-type dog has been found as evidence. These dogs were favored by Hungarian kings in the 15th century. Later, the dogs were used as livestock guardian dogs, especially in the wet pastures of the high mountains. In addition to livestock guarding, the dogs had a great reputation for protecting their families. The dogs were nearly wiped out during World War II, either killed by German and Soviet soldiers, or taken by German police for their own use. It’s said that there were only between 12 and 30 Kuvaszok left in Hungary following the war. Fortunately, the breed has been brought back from near extinction, though they remain rare. The Hungarian Kuvasz, as they are sometimes known, is a bold and courageous dog. They are more than capable of protecting their home and family. However, they are not bred to be guard dogs in the way that some other breeds are. As a livestock guardian dog, this breed can be quite independent and capable of making their own decisions. They do not take orders or handle training the way a German Shepherd dog does. These dogs can think for themselves and decide who and what they think may be a threat. They are often reserved and polite with strangers. These dogs are not usually a cuddly, affectionate type. They are devoted and loyal but they don’t feel the need to display affection as many breeds do. Thet usually gets along very well with other dogs and other pets. They are usually good with your children and will protect them. However, if your children have friends visiting, your dog might feel that he needs to protect your kids from the other children, so you could have problems. This dog breed needs to be raised with children and well-socialized if they are to be around them. You need to supervise at all times. They should be socialized and trained from a young age so you can have as much control as possible. They are not recommended for all families and they need to have an owner who is experienced with dogs. Living Environment – These are very large dogs and they can also bark as a means of warning or protection. For these reasons they are not recommended for apartment living. They typically do best in a large yard or in a place that’s big enough that they won’t bother anyone. They need a great deal of daily exercise. They also enjoy cooler weather. Hot weather can be a problem if they are left outdoors too long. Make sure you provide shade and plenty of water. Grooming – These longer-haired dogs should be brushed regularly to control shedding. In cooler climates they will shed seasonally, but if you live in a warmer climate these dogs will probably shed some year round. Do not bathe this breed too often since this will remove oils from the coat which help protect it from dirt. Diet & Exercise – Dietary requirements are considered normal for this breed. However, they are a large dog and they do eat a lot. Be prepared for a large dog food bill. Puppies should not be overfed since this breed is prone to musculoskeletal problems if puppies are allowed to grow too fast or become overweight. Feed adults a diet for large breed dogs. This large dog breed needs plenty of daily exercise. Long walks are good. So is jogging. Consider taking them for a slow run attached to your bike. Health – In the health department, this dog breed can be subject to developmental bone problems. Do not overfeed puppies. Keep them on the lean side and limit their exercise when they are young. Canine hip dysplasia can be a problem. Other possible problems include osteochondrosis dessicans (OCD) or bone spurs on the elbows or shoulders; hypertrophic osteodystrophy; and dog allergies and skin problems. If you are interested in this dog breed you should talk to a breeder about possible dog health problems. The Kuvasz is a very intelligent dog breed but they are also very independent. They think for themselves. Dog training can be difficult. You should begin training at an early age, stressing basic dog obedience commands. Use positive dog training techniques (praise, reward). Don’t be discouraged if your progress is slow. That is normal with this breed. If you keep at it you will succeed. You should also work on early socialization with this breed to help them become friendlier to people and more accepting of having people in your home, especially visiting children.